EMC is redefining storage and data protection for mid-sized organizations. Once, enterprise-class functionality was out of your reach. 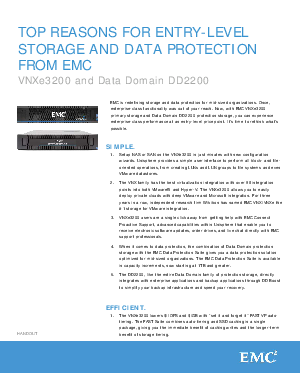 Now, with EMC VNXe3200 primary storage and Data Domain DD2200 protection storage, you can experience enterprise-class performance at an entry-level price point. It’s time to rethink what’s possible.